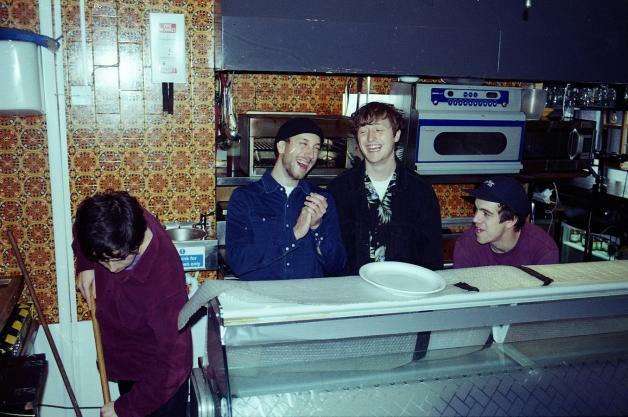 Boy Azooga have shared new track 'Do The Standing Still' - tune in now. The band released their splendidly frenetic debut album '1,2 Kung Fu!' earlier in the year, a blast of energy and imagination. We're still hopelessly addicted, and we're delighted to share Boy Azooga's latest studio missive, a cover of a Welsh punk rarity. 'Do The Standing Still' was crafted by Welsh group The Table back in 1977, with Boy Azooga giving it a modern makeover. In 1977 Tony Barnes, Russell Young, Len Lewis and Mickey O Connor, collectively known as The Table, released their comic book dead body dance floor classic ‘Do The Standing Still’. The Cardiff band were originally called ‘Do You Want This Table?’. They later shortened themselves to The Table so they could say they were a household name. They were signed to Virgin Records just as the punk thing was becoming harder. In response, the single cover shows the band stood in the women’s lingerie department of Oxford Street’s Marks & Spencer’s store, thinking this would make them appear tough - especially as they had not asked permission. As huge comic book fans, the songs lyrics reference multiple Marvel Comic Fantastic Four titles amongst the other chaos. It’s an amazing song so we decided to cover it, with super hero Eddie Al-Shakarchi behind the desk. Apparently people used to rush the dance floor and stand still for the duration of the song when it came on in clubs or when the band played it live. We hope you enjoy our cover and accompanying video featuring Kliph Scurlock, a polar bear and some confused members of the public. Have a good day. Long live The Table. For tickets to the latest Boy Azooga shows click HERE.